How To – Managed Returns in Linnworks. Processing Returns & Exchanges is common practice in eCommerce business. Your stated returns policy can make or break a sale on your online sales channels. Customers want security when they make their purchase, security in knowing that they can approach you for a refund/ exchange if necessary. Offering a quality Returns Policy hasn’t previously optimised your visibility, but goes a long way with your retention. It might well be the decider that migrates a consumer from the Shopping Cart to the Checkout. Although this might not heighten your visibility on the marketplace, eBay say that by offering a simple and clear returns policy, sellers have seen up to 9% in additional sales. And a clear, simple returns process is what you get with eBay’s Managed Returns Process. If you haven’t opted into eBay Managed Returns then you can do so through the Sell section of My eBay. Are you eligible for Managed Returns? If you have opted into the eBay Managed Returns Functionality on your eBay account(s), you can enable the Managed Returns Functionality in Linnworks. Linnworks incorporates post-sale functionality such as Returns, Resends, Exchanges and Refunds into the Order Management System. All of which are accessible from the processed orders screen overview. Let’s have a quick look at these in further depth. 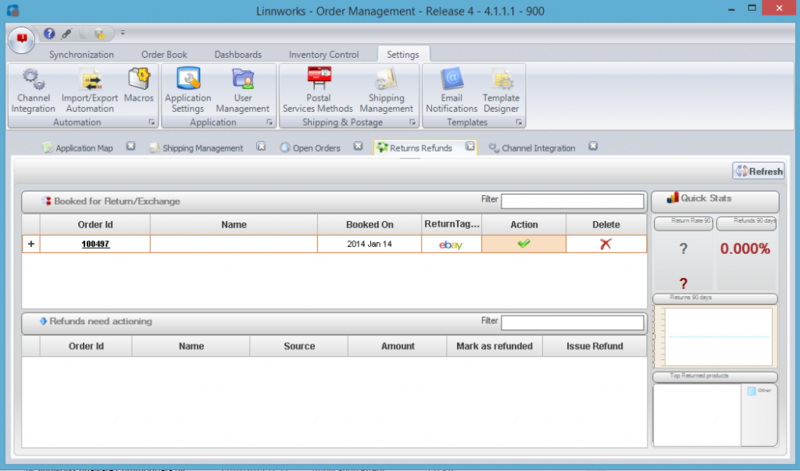 In Linnworks, when an order is returned the order’s audit trail and return status is updated to show that the item has been returned. This item will then be put back into stock unless you label the item as scrapped. Orders can often contain multiple items, to facilitate this, items for orders can be returned individually and you can use Order Notes to input the reason for return. Sometimes in eCommerce, your parcel(s) might not reach the paying customers, it could be lost by the courier, not picked up at the post office – this happens often when Cross Border Trading. So from time to time you will have to resend the item. In Linnworks if an order is resent, a new order is created to represent the resend. Both the original order and the new order will show a relation to one another. Orders can contain multiple items, so we have designed it so that you can select individual items for resending. When an order is returned, providing that the item isn’t being scrapped, the item will be put back into stock. Exchanges are slightly different – When exchanging a product you have the option to include additional payment, for example if the latter item is more expensive than the former. Once the exchange has been processed, a new order is made with the new items and any additional charges. Linnworks is not a Payment Gateway like PayPal. This means that unfortunately we cannot process the payment from the software. However in online retail there are many times when you will need to offer a refund without processing a return or an exchange. I.e if the order was lost in transit or the order has been cancelled. For accountancy & reporting however you are able to process a refund from the processed orders screen. You can specify whether you have actioned the refund on the payment gateway, there is a link that will take the user directly to the channel or payment provider to process the refund if you have not done so already. Enabling eBay Managed Returns in Linnworks. To start you will have to enable eBay Managed Returns in Linnworks. You can do this from Channel Integration > Config. You will be able to enable this functionality from the bottom of the Config screen. If you enable Managed Returns on your eBay Channel, you are enabling the functionality to integrate with the existing returns system in Linnworks. Once you have enabled this the Managed Returns Config screen will be available. This is where you can specify your Primary Returns Address, with eBay Managed Returns you can have multiple returns addresses. Here are some tips to take into consideration. If you don't provide a specific return postage address on the listing, the buyer will send the item to your primary return postage address. When a buyer initiates the Returns Process, the buyer has 14 calendar days to return the item to you in the same condition it was received. If you specify multiple return addresses, you will have 2 working days to specify which address the order needs to be sent too. The Managed Returns Config screen will allow you to specify whether you are using RMA numbers:. 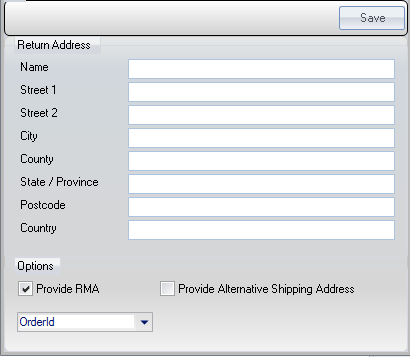 If you’ve set your returns preferences to use RMA numbers and require an RMA to be generated for customer returns, you can enable this setting here. An RMA (return merchandise authorization) is a numbered authorization provided by a mail-order merchant to permit the return of a product. RMA numbers are important to both the seller and the customer. An RMA number tells the seller that a return is being made and offers protection against fraudulent returns. If you are using RMA numbers you will need to specify an identifier that the RMA is related too. You will have a few options that are available from the drop down menu. Order ID – Will use the Linnworks Order ID as a reference. Reference Number – Will use the eBay reference number stored in the Linnworks Order. External Reference Number – Will use the eBay secondary reference number stored in the Linnworks Order. Generated – Will generate a random RMA reference for you to use. How does eBay Managed Returns work in Linnworks? When a buyer has started a return you will get an email notification from eBay. Upon Synchronisation the return will appear in the Returns Refunds Screen (accessible from Order Book). This is where you will see all of your returns. If a return has been generated via eBay Managed Returns functionality, you will see an eBay logo in the Return Tag Column. As shown below. Clicking on the Action button will display Tracking Information and Returns details for the order. Once you have received the returned item, click the Issue Refund Button to process the refund to eBay. Once you have completed these steps, the return will be converted from a Return Booking to a completed Return.